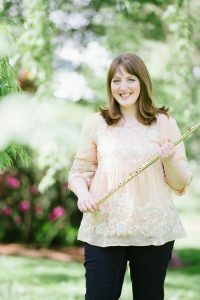 Kelly Sulick currently teaches at the University of Virginia and serves as Principal Flute in the Charlottesville Symphony at the University of Virginia. Prior to her appointment, she served as Principal Flute with the Evansville Philharmonic Orchestra and as Consortium Instructor of Flute at the University of Evansville for three years. She earned her Master of Music degree in Flute Performance from the University of Southern California and recently completed three seasons as principal flute with the Young Musicians Foundation Debut Orchestra in Los Angeles, California. Prior to her graduate studies, she earned a Bachelor of Music degree in Flute Performance and a Bachelor of Arts degree in English Language and Literature from the University of Michigan, where she graduated with highest honors and was named a James B. Angell Scholar for her academic achievements. She has performed as Principal Flute with the USC Chamber and Symphony Orchestras, the University of MIchigan Symphony Orchestra and Symphony Band, and the Livingston Symphony Orchestra. She has appeared as a concerto soloist with several ensembles, including most recently the Evansville Philharmonic Orchestra and the Southern Ilinois Music Festival. Equally at home on the concert and popular stages, Ms. Sulick has performed and recorded with several rock bands, including The New Fidelity, a Mod-Power Pop outfit from southern California; Superdot, a world music group based in Detroit; and Ann Arbor, Michigan singer-songwriter Timothy Monger. A champion of new music, she has premiered several works and participated in the Minimalist Jukebox series, a music festival curated by John Adams. Ms. Sulick won second place in the 2010 National Flute Association’s Young Artist Competition, and was awarded the prize for the best performance of Kristin P. Kuster’s “Perpetual Afternoon.” She has been a finalist or semi-finalist in numerous national competitions, including The Flute Society of Kentucky Young Artist Competition, the University of Michigan Concerto Competition, the Pasadena Showcase House Instrumental Competition, the Young Musicians Foundation National Debut Competition, and the Frank Bowen Young Artist Competition. She has received the Leni Fe Bland Foundation Scholarship, the Mary Adams Balmot Memorial Scholarship, and the Thornton School of Music Dean’s Scholarship. Ms. Sulick has recorded several compact discs, including William Bolcom’s Songs of Innocence and of Experience under Leonard Slatkin, a Naxos release that received four Grammy awards including Best Classical Album. Her principal teachers include Jim Walker and Amy Porter.